Even though I try to force myself to branch out & embrace bold colors every now & then, I’ll admit that I’m a neutral-lover at heart. I personally find these classic hues to be the easiest to wear, extremely versatile & endlessly chic. You may remember last month when I first shared about the limited edition collection from Charming Charlie x StyleWatch Magazine (see the full post here). Well, I’m excited to share with you today that they’ve just launched a new batch of fall styles for this line that are amazing! I had the chance to hand-pick my favorites and I put them all together into a casual-meets-sophisticated fall look. This olive saddle bag instantly caught my eye & it’s even more gorgeous in person. I love how the gold hardware detail gives it a high-end feel + it’s just the right size to carry every day (matching wallet here). Other crossbody bags I’d recommend are this studded style & this saddle bag. I find that I tend to wear more pendants this time of year, so I was thrilled when I saw this beaded spade necklace – it’s the perfect style for wearing with more casual tops & sweaters to add a little polish. I also picked up this velvet choker & this sleek bolo necklace, which I plan on layering together for a cool modern feel. 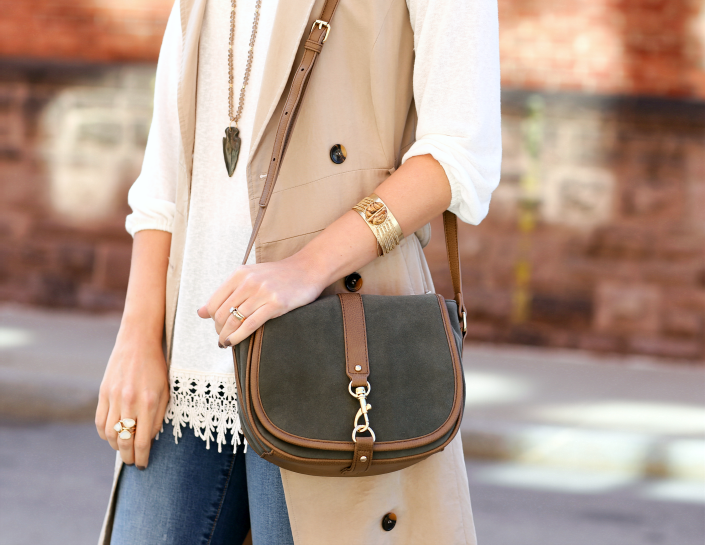 I love when I can find neutral basics with interesting details that help elevate them. This pretty crochet-hem top can also be worn off the shoulder and, thanks to the longer length, I’ll also be able to wear it with leggings (it comes in navy blue too!). This marled sweater is another great twist on a casual style – I’d pair it with cropped ankle pants & pointed-toe flats. 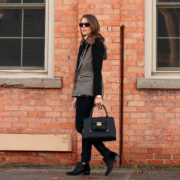 Though the sleeveless trench I’m wearing here is an old thrifted find, warmer options to try for fall are this fringe vest & this cozy reversible vest. You can view the entire Charming Charlie x StyleWatch Collection here & be sure to share your looks on social media using #StyleWatchCC to be automatically entered for a chance to win weekly prizes!